Jacobo Mendoza and son Jacobito holding rugs they have woven. Jacobo Mendoza is descended from a family of famous Zapotec weavers, the youngest of eight children. 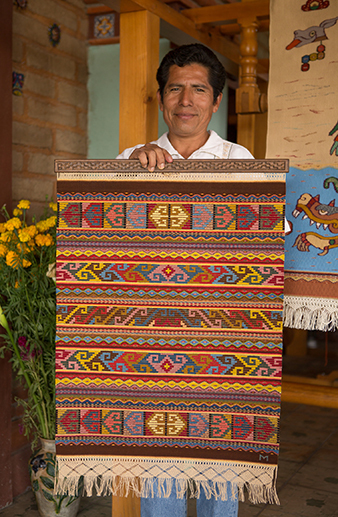 His wife, María Luisa, is also from a family of Zapotec weavers and they both gather the plants and make the dyes for their rugs. Children begin to weave on small looms doing practice pieces to master the complex Zapotec designs. 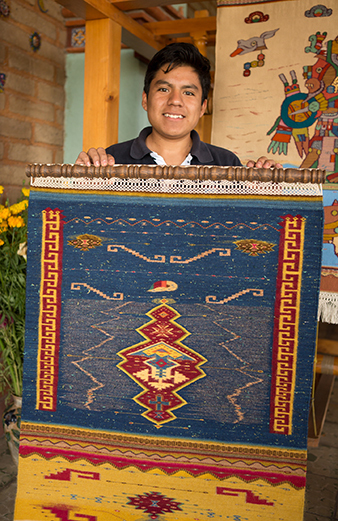 Today Jacobito and Sophia weave beautiful tapetes alongside their parents.